2004 Leaf Certified Materials Baseball, one of the flagship brands of the Donruss portfolio, releases Wednesday with the potential to be one of the most successful Certified products to date. A product known for delivering spectacular game-used memorabilia and autograph content stays true to its core with an average of four game-used memorabilia or autograph cards per box, many of them hailing from the popular Fabric of the Game and Mirror parallels. But the Donruss product development team has raised the bar for 2004 by incorporating more autograph material cards, more prime-swatch material cards and improving the odds on autograph cards at the box level. "In short, we've added more autographs and more prime material pieces to a product that was largely considered the Set of the Year in 2003," says Donruss baseball brand manager Ben Ecklar. "We can't aim for anything less than Product of the Year for 2004. The challenge is just building on last year's success and doing whatever we can to ensure that we continue raising the bar on a product with extremely lofty collector expectations." Donruss officials provided an early glimpse of 2004 Leaf Certified Materials during the just-completed National Sports Collectors Convention, hosting distributors and dealers in their booth for some sneak-preview pack busting. The response, as expected, was overwhelmingly positive. "The reaction we got from our distributors and dealers confirmed our belief that this will be one of the most successful baseball products of the year," says Donruss spokesman Tracy Hackler. "There was a tangible buzz on the show floor when word got out that Leaf Certified was in the building. We�re confident that collectors will keep that buzz thriving once the product goes live." 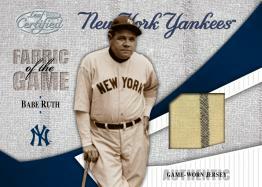 2004 Leaf Certified Materials, which carries an SRP of $10 per pack, goes live on Wednesday.